YOU WILL BE ABLE TO BUY THE LIMB SECTION FROM THE RX TO UPGRADE YOUR EXISTING R9! 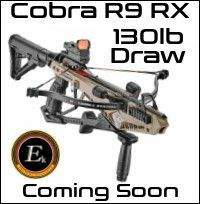 The brand new Cobra System R9 RX can only be described as an upgrade to the game changing R9 there is nothing like this on the market nor has there ever been this type of crossbow before. Designed as a pistol but it really comes into it's own when you add the included AR stock. The R9 RX has been designed to fully assemble in seconds making it ideal for compact storage and travel, the limb is provided strung and does not need to be removed to pack away. 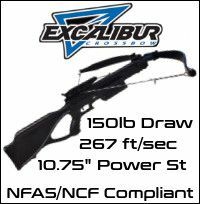 The RX version now has a very impressive 130lb limb propelling a full size bolt to speeds of 240 ft/sec, to compensate for the extra power the limbs now have string stoppers essential in slowing down the string after bolt release. Fear not if you have already purchased the original R9 the new 130lb limb set is available complete with built in string stoppers.